NMC math instructor Mary Burget and student Lauren HayesDriven to catch the Soviets in the space race of the 1950 and '60s, black female NASA mathematicians solved the problem of putting astronauts into orbit, a story told in Hidden Figures, nominated for Best Picture* at this weekend’s Academy Awards. 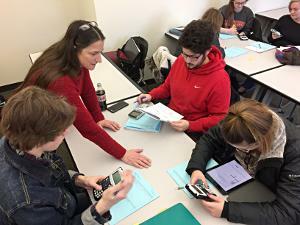 Driven to offer NMC students more pathways to meet math graduation requirements, the math department solved the problem with Math 120, a class that, a la NASA, turns students into problem-solvers. Not just for the course, but for life. 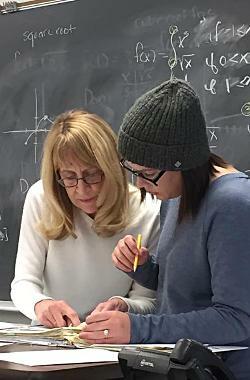 “Our whole goal is that it’s more than math — they become good problem-solvers,” department chair Deb Pharo said of Math 120, added to the curriculum just two years ago as a way for liberal arts students whose programs don’t require additional math to fulfill graduation requirements. But now and then a funny thing happens on the way to simply checking off the requirement: A student discovers a hidden passion for figures, and their whole career trajectory changes. Lauren Hayes (above, right) is Exhibit A. Becoming a problem solver starts with students having confidence in their abilities. When she enrolled at NMC in 2015, Hayes, 27, didn’t. She failed her last math class before she graduated from Traverse City West High School in 2008 and wound up in a developmental math course. Her instructor, Mark Nelson, started building her confidence. In 120, officially titled Math Explorations, it took off. “Math 120 made me feel proficient, like I could figure things out,” Hayes said. The course teaches students the “beauty and utility of mathematics” by presenting practical problems like personal finance and budgeting. She enrolled in another math course, Probability and Statistics, which she’d been dreading. Instead, she “breezed” through it. Encouraged by Mary Burget, her 120 instructor, who turned to math herself after a first career in social work, Hayes switched her major from psychology to engineering. “Once I had in my head that I was good at it, it was almost like I was,” said Hayes, who’s now enrolled in college algebra. In fact, she’s craving more math than her engineering classes currently offer. “I don’t really want to build things so much as understand how things work. I feel like math does that for me,” Hayes said. That’s music to Burget and Pharo’s ears. While Math 120 exists so students can meet requirements, it’s also a practical, real-world course that can help students with lifelong decision making. ﻿Probability of Hidden Figures winning Best Picture - 1:25, per OddsChecker.